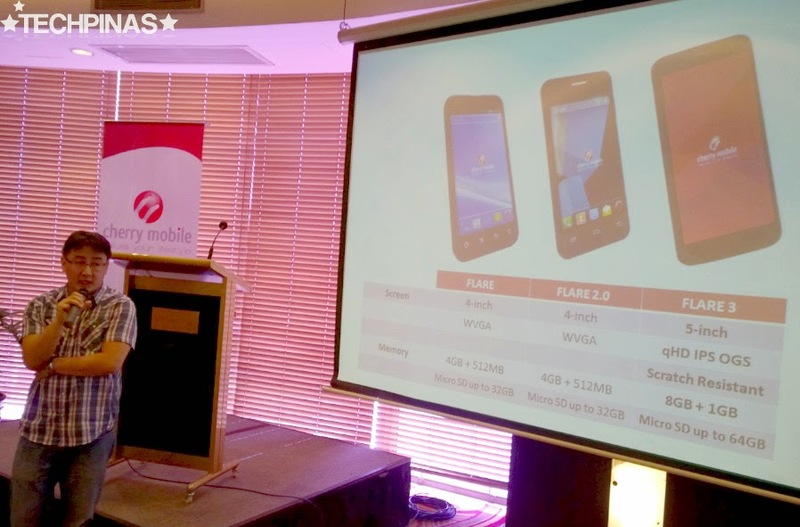 Given the tremendous market success of its direct predecessors - the first generation Flare and the Flare 2.0, Cherry Mobile Flare 3 truly has a lot to live up to. Nonetheless, considering everything it offers to consumers for a price almost everyone can afford, I believe the hybrid has what it takes to match if not altogether eclipse the lofty achievements of the models it superseded. Dubbed as the "Phablet ng Bayan" because of its unbelievably low Php 3,999 price tag, Cherry Mobile Flare 3 is the ideal device for budget-conscious Pinoy consumers who want to experience the benefits of a Quad Core Android smartphone with a screen akin to that of a mini tablet. As I've explained, a phablet is basically a cross between a smartphone and a slate -- giving you the portability and easy-of-use of the former while flaunting a massive display similar to that of the former. For Cherry Mobile, any smartphone having a 5-inch screen and larger already falls in this category. 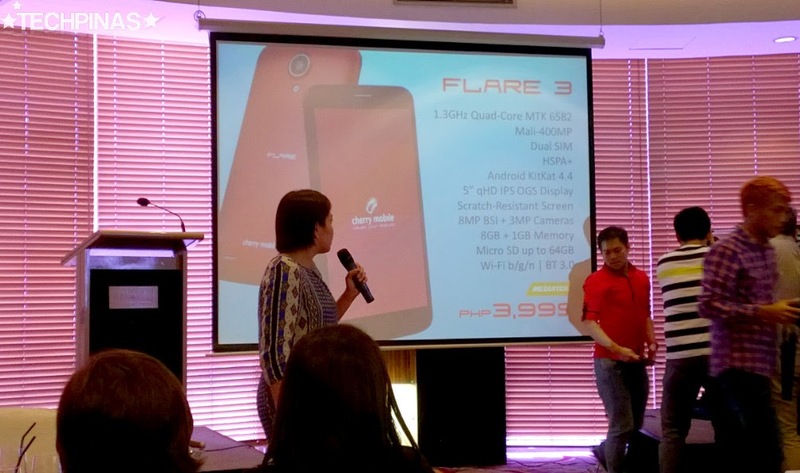 Miss Poch Zenarosa, Marketing Head of Cherry Mobile, explaining the main selling points of Cherry Mobile Flare 3, during the phablet's official media launch held at the Hyatt Hotel in Manila last July 30, 2014. 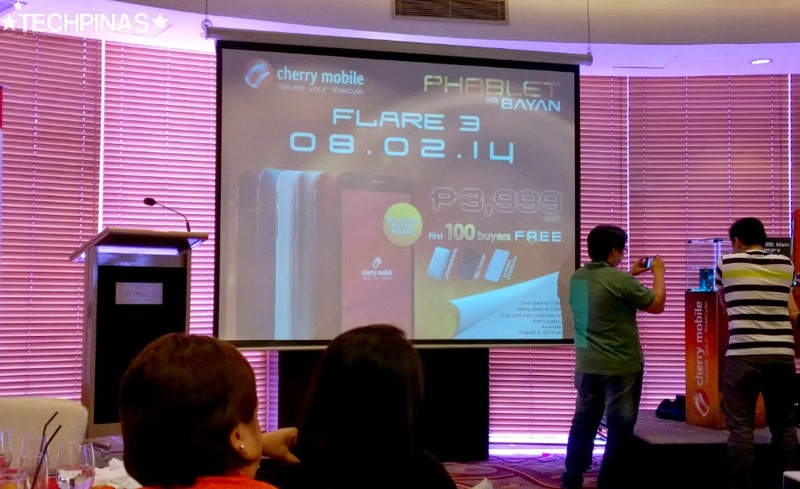 Specs-wise, Cherry Mobile Flare 3 represents a considerable upgrade from both the first Flare and Flare 2.0. 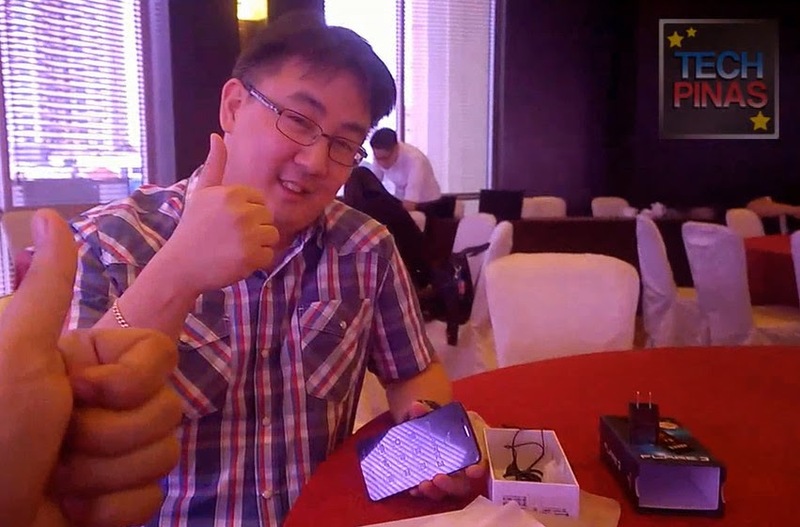 The 2014 iteration is equipped with a 5-inch qHD IPS OGS display underneath scratch-resistant glass touchscreen, a Quad Core 1.3 GHz ARM Cortex A7 and Mali 400 GPU based MediaTek MT6582 chipset, 1 GB of RAM, 8 GB of expandable storage, 3G HSPA+ connectivity support, and a removable 1,980 mAh Li-Ion battery pack. So what's the Antutu Benchmark Score? Well, the combination of the above-mentioned innards usually give an Antutu score in the area of 17,000 to 17,800. We ran the test on the phone during the launch and sure enough, we got a score of 17,380. In terms of imaging capabilities, the phablet comes replete with an 8 MegaPixel autofocus camera with LED flash and BSI sensor at the back and a 3 MegaPixel fixed focus front cam for selfies. As for its design, the back part of Cherry Mobile Flare 3 - I would say - is greatly reminiscent of Samsung Galaxy S4 from 2013. Both devices have a slightly protruding camera module that's located in the same spot -- right smack in the middle of the upper portion. The resemblance is especially obvious on the Red, Blue, White, and Silver versions which all have a rear plate with glossy or glazed finish. 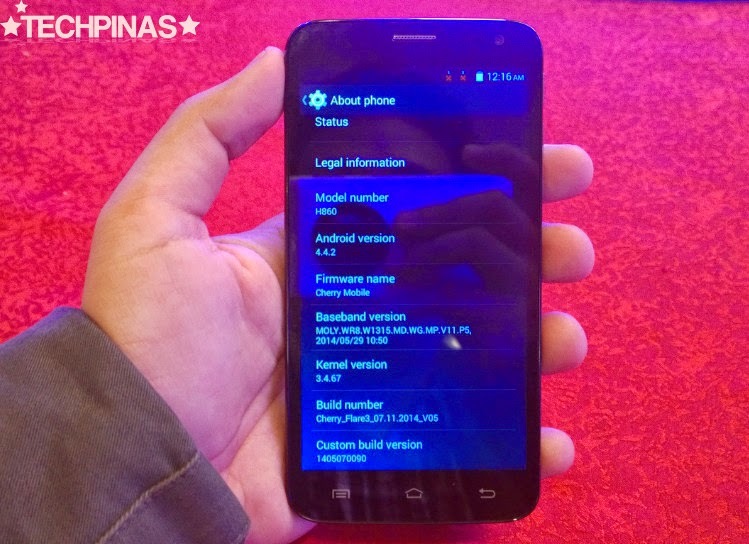 Cherry Mobile Flare 3 runs Android 4.4.2 KitKat operating system right out of the box; Making it the first and currently most affordable phablet from a local handset company to run the latest version of Google's mobile OS that's available to consumers. 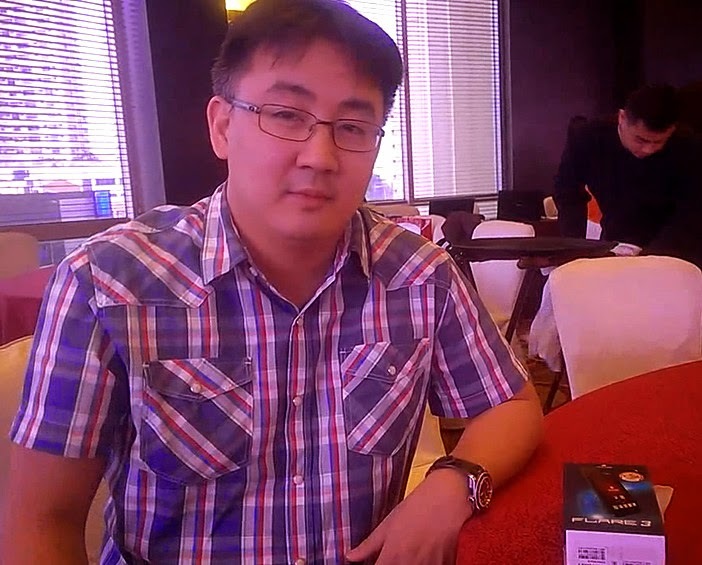 After the event, I got the chance to interview Mr. Lonson Alejandrino, Product Marketing Manager of Cherry Mobile for Android smartphones, about their newest release and apart from answering my questions, he also generously gave me a quick unboxing and features rundown of Cherry Mobile Flare 3. I got it all on video, TP Friends, so if you will, check it out. The package includes the unit itself, standard headphones with in-ear silicon buds, travel charger, microUSB to USB connector cable, user manual, and the warranty certificate. Again, Dual SIM (Regular Mini + MicroSIM) Dual Standby Cherry Mobile Flare 3 is now available at all CM Concept Stores, Kiosks, and partner gadget shops both online and in malls. It's out in four glossy colors that mentioned above and one in matte, the elegant Black version featured in the video.